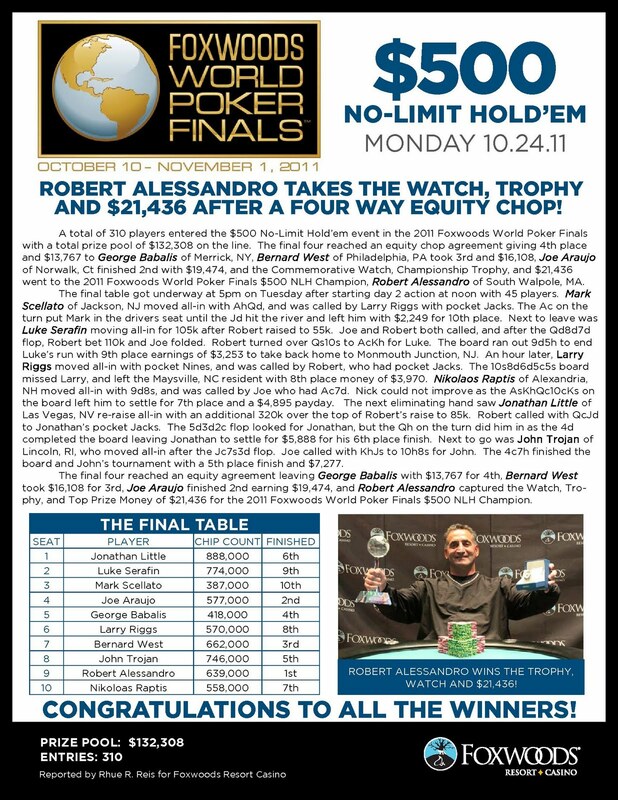 On the final hand of the night, we lost a player and are now in the money. The 27 remaining players will return at noon tomorrow for Day 4 of the World Poker Finals. 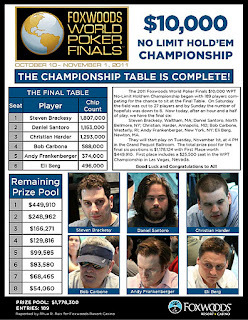 The end of Day 3 chip counts and Day 4 seating assignments will be posted shortly here on FoxwoodsPoker.com. 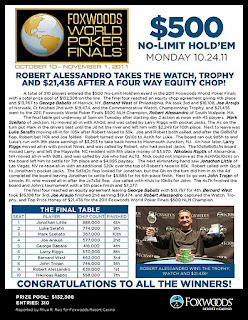 Kathy Liebert has been eliminated in 29th place at the World Poker Finals Main Event. With 28 players remaining and 27 spots cashing, play is now hand-for-hand. 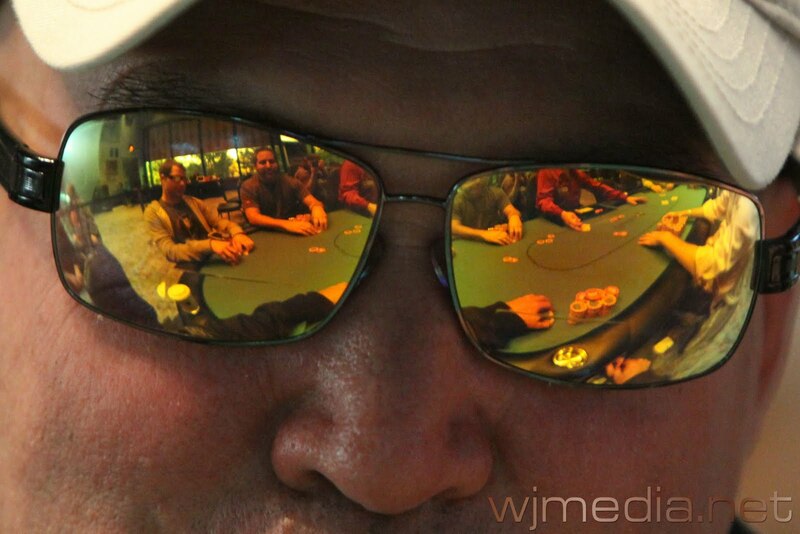 When play resumes, the blinds will be increased to 1,500-3,000 with a 500 ante. With 31 players remaining, the average chip stack is now 183,000. Jason Mercier gets all-in with pocket aces on Day 3 of the World Poker Finals but runs into his opponent's two pair. The blinds have been increased to 1,200-2,400 with a 400 ante. With 37 players remaining, the average chip stack is now 153,200. Matt Stout has just doubled up to over 100,000 when his pocket aces held up against his opponent's pocket tens after getting all the chips in the middle before the flop. 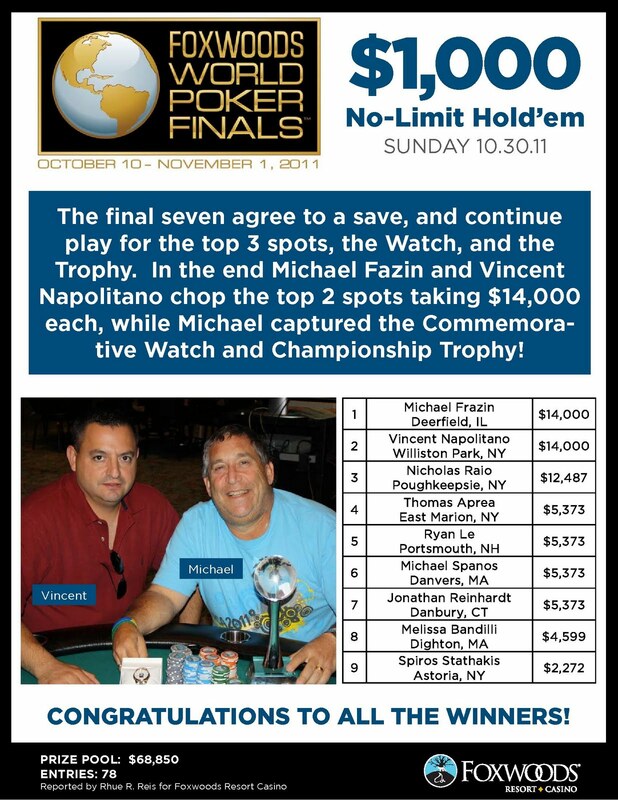 David Sands has just been eliminated from the World Poker Finals Main Event. 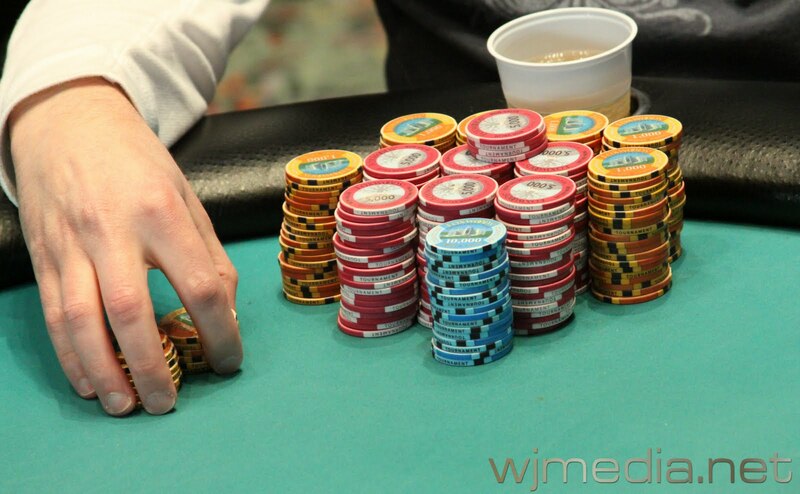 With 47 players remaining, the average chip stack is now 120,600. After starting Day 3 of the World Poker Finals with 92,500, Jonathan Little has slowly chipped up and now sits on nearly 250,000 in chips with 47 players remaining. 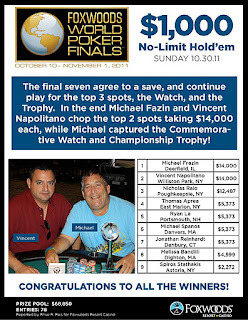 Jason Mercier talks with Jay "WhoJedi" Newnum on Day 3 of the Foxwoods World Poker Finals. The players have returned from break and the blinds have been increased to 800-1,600 with a 200 ante. 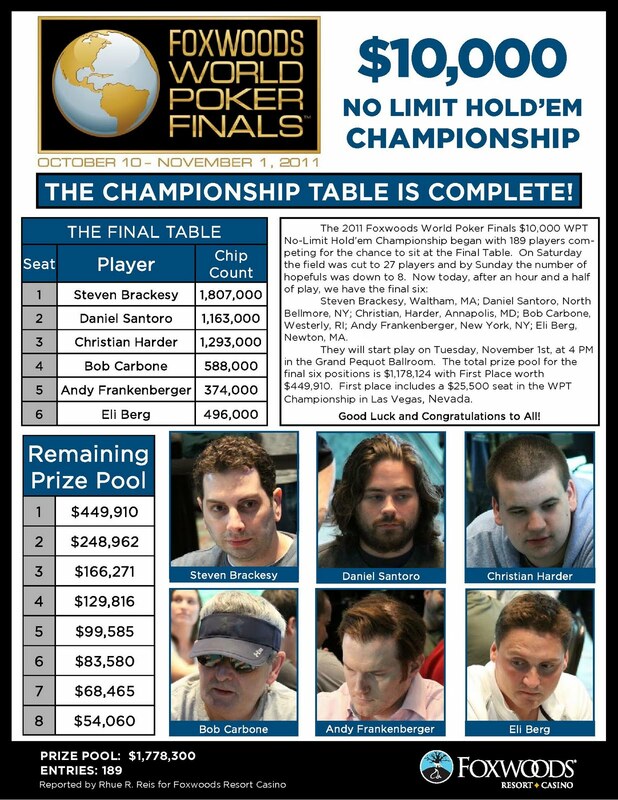 With 54 players remaining, the average chip stack is now 105,000. 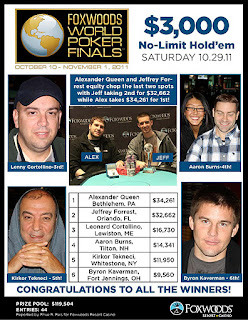 World Poker Finals Defending Champion Jeff Forrest is eliminated by Christian Harder on Day 3 of the 2011 Main Event. Erik Seidel got his last 13,000 in before the flop with A-Q against the pocket fives of Bernard Lee. Lee's pair held up to send Seidel to the rail in 57th place. 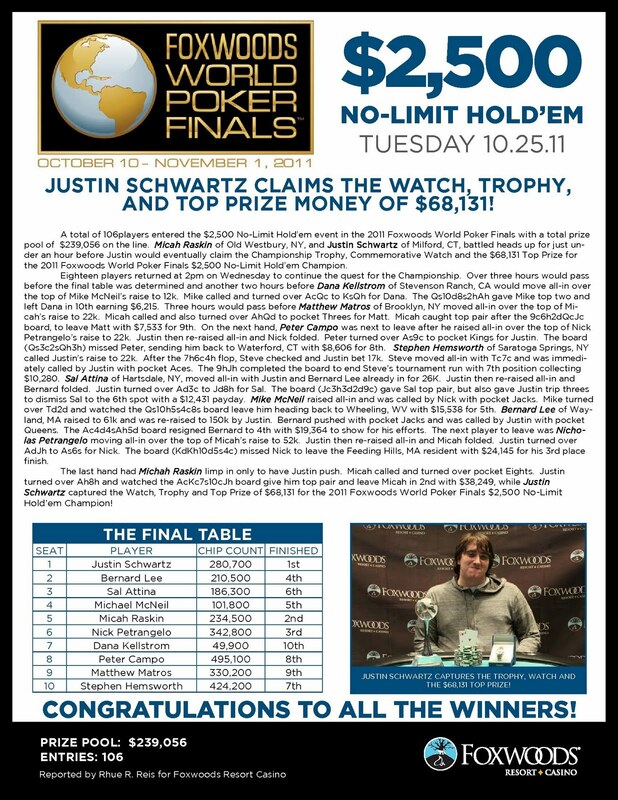 Defending World Poker Finals Main Event Champion Jeff Forrest has been eliminated from the 2011 Main Event by Christian Harder. Video of the hand will be posted shortly. James Campbell has been eliminated early on Day 3 of the Main Event by chip leader Dan Colp0ys. On an A-10-7-9 board, Campbell got it all-in with 10-7 against Colpoys A-9. The river bricked out for Campbell and he was eliminated in 62nd place. 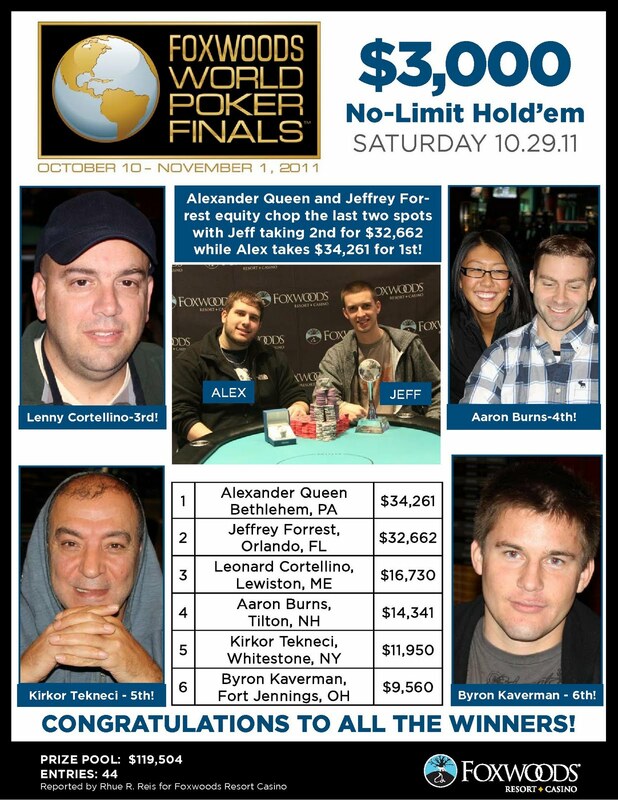 To watch the live stream of the feature table, just click "Watch LIVE Feature Table" at the top of the page. We are just minutes away from the start of play on Day 3 of the $10,000 World Poker Finals Main Event. 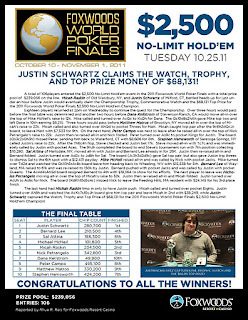 There are 66 players returning today and the blinds will be starting at 600-1,200 with a 200 ante.